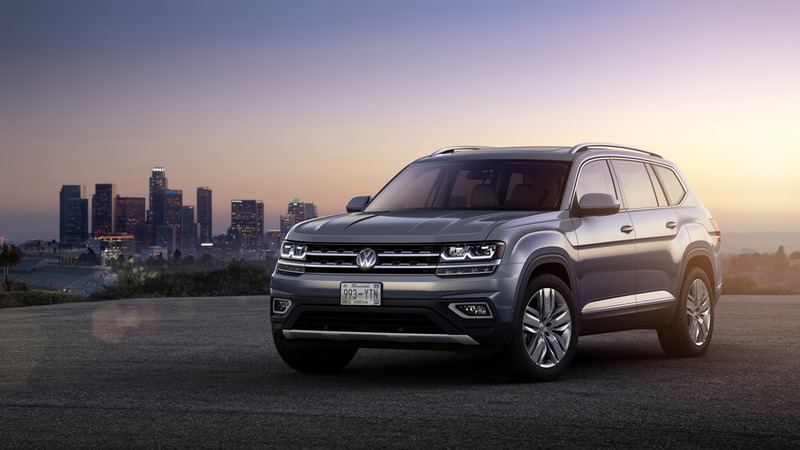 APR specializes in tuning Volkswagen Group's products, and the firm's latest undertaking gives the Atlas seven-passenger SUV a lot more swagger. This mean, green machine has a big boost in power and some custom suspension pieces for a combination of speed and off-road capability. The tuner starts with a 2.0-liter turbocharged Atlas, and APR then installs a bevy of upgrades, including the turbocharger from a Golf R, carbon fiber intake, and revised turbo plumbing, including a custom-fabricated cat-back exhaust. The result of these mods pushes the output to 350 horsepower (261 kilowatts ) and 350 pound-feet (475 pound-feet) of torque in comparison to the stock 235 hp (175 kW) and 258 lb-ft (350 Nm). To complete the package, APR also works on the suspension and brakes. The company machines a variety of billet suspension parts, including new rear trailing arms, to lift the ride height by 1.5 inches. The Atlas now rides on a set of 20x9-inch forged wheels with Toyo Open Country M/T tires. Six-piston calipers help the big SUV stop a little better. “With 350 horsepower and 350 pound-feet of torque we’ve surpassed the output from even the larger V6 engine, and we’re working to push the envelope even further in the future. The combination of custom hardware and equipment from our current product line has really transformed the Atlas’ performance," Mitch Williams, CEO of APR, said in the custom Atlas' announcement. For now, APR's tuned Atlas is a one-off. However, the company is looking into offering future performance upgrades for the SUV. Creating components for the SUV might be a smart business move because it likely wouldn't take much work to adapt them to the upcoming five-seat, two-row variant. That way, APR's investment in a single product could be sold for multiple models. 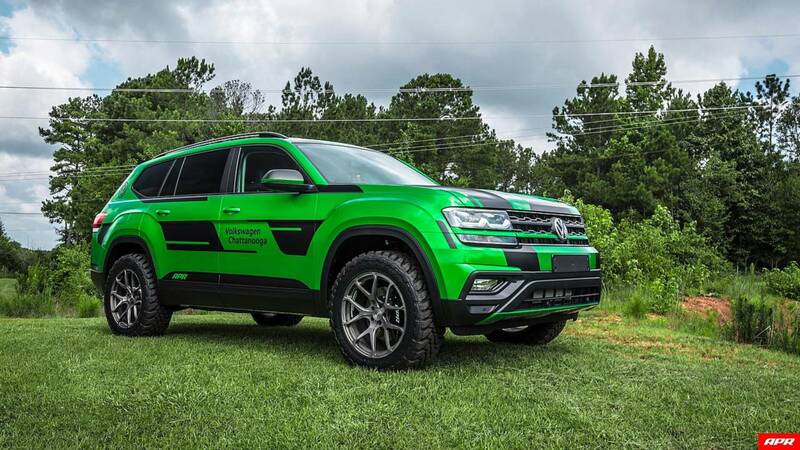 Opelika, Ala. (August, 2018) – APR, the leader in Volkswagen and Audi tuning, has built a one-off custom Atlas featuring more horsepower, improved braking and greater off-road capabilities. The custom-built Atlas is equipped with a 2.0 TSI engine and an all-wheel-drive, making it the perfect off-road test bed for APR’s lineup of performance hardware and software. The project started life at 235 horsepower and 258 pound-feet of torque, but APR’s engineers were able to increase output to 350 horsepower and 350 pound-feet of torque. This was made possible by installing a factory IS38 turbocharger from the VW Golf R along with APR’s ECU Upgrade, Carbon Fiber Intake System, Cast Race DP Exhaust System, Turbo Inlet Pipe, Turbo Muffler Delete, and a custom fabricated Catback Exhaust System. In addition to the powertrain modifications, APR installed its 6-piston 350mm Performance Brake Upgrade to bring the SUV to a commanding stop. To provide clearance for the Toyo Open Country M/T 275/55/20 tires, APR CNC-machined new billet suspension components to lift the Atlas an additional 1.5”. Furthermore, new rear trailing arms were fabricated to complement the lift kit. APR’s Light-Weight S01 20×9-inch Forged Wheels are illuminated on the build by wheel well/rock lights placed beneath the Atlas. Lastly, a custom vinyl wrap was designed by APR and installed by Digital Precision in Alpharetta, Georgia.